Urgent update on possible worldwide spread of tilapia lake virus (TiLV). Recently, we released a warning of TiLV in Thailand including an improved semi-nested RT-PCR method for rapid detection. The Fish Health Platform in Centex, BIOTEC/Mahidol University has obtained positive test results for TiLV from other countries in Asia where it has not yet been reported. Further, the majority of our archived samples collected from previous disease outbreaks in several tilapia hatcheries in Thailand during 2012-2017 have tested positive for TiLV, indicating the presence of TiLV in Thailand even before the virus became known to science in 2013. The origin of the disease is currently unknown, but many countries have been translocating tilapia fry/fingerlings prior to and even after the description of TiLV. Based on records we could obtain about such translocations, we have prepared a map that contains a list of 5 countries with confirmed reports of TiLV infections and a list of 43 other countries that we believe have imported tilapia that may have been infected with TiLV. We hope that widespread surveillance for TiLV in the Tilapia industry and in translocated fish will help reduce the impact and spread of this disease. We recommend that the 43 countries we have listed quickly initiate surveillance for TiLV in cultured Tilapia, since the virus may have been introduced via direct or indirect translocation of fry/fingerlings from the five countries where it has been reported. Biosecurity should be applied to prevent wider spread of the disease especially by countries with no predictive record of TiLV risk. 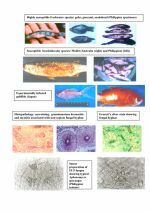 Since TiLV infects very early developmental stages of tilapia (fertilised eggs, fry, and fingerlings) when fish immune system is not fully developed, the use of vaccines may not be an effective control approach. Research should be promoted for the development of methods to clear TiLV from infected tilapia broodstock and allow production TiLV-free fry/fingerlings. Programs should be promoted to develop Tilapia stocks specific pathogen free (SPF) for TiLV and other pathogens as a potential approach to limit impact of Tilapia diseases globally. Since TiLV infections result in highly variable mortality (9.2-90%), it is urgent that research should be promoted to discover the underlying reasons (e.g., research on the correlation between TiLV virulence and genetic types or other factors).